Carol, what a great idea! "If all the beasts were gone, man would die from loneliness of spirit." Chief Seattle. These words could just as well have been John's words. John had an Indian's love of Mother Earth. "I am one who dances with the mountains. I am one who dances in the wind." These are the words of John Denver, "Oh the Yellowstone, Oh the buffalo free, Oh my brother the wolf, my lover the moon." John loved to be in the "out of doors", the wilderness. He dedicated his life, musical and personal, to spreading his dream of preserving that wilderness and all it's inhabitants. And we are finding out that he did get his message across, to many. John Denver is a phenomenon. A person outstanding for some extreme quality or achievement. John had the extreme quality of being able to impact the lives of thousands, without ever physically touching them. And for the one's who were so lucky to have had the privilege of actually meeting this man, he performed miracles. John's achievement was that he brought to the attention of the world, the beauty and grace of the mountains, the rivers and oceans, the gentle wildlife, and the fierce need for us to join together to preserve our natural resources. His songs were his prayers to the non believers. I am a water-color landscape artist. 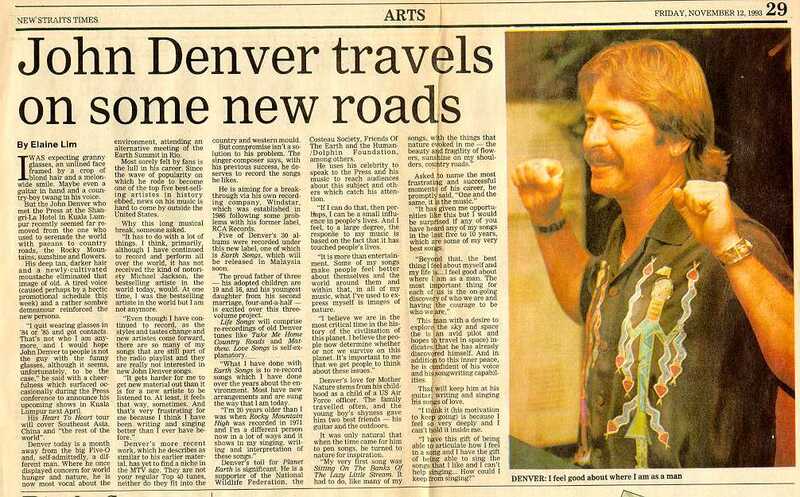 For over 26 years John Denver has been the inspiration behind all my paintings. Although I was born with a deep love for the wilderness, and have spent most of my life as a camper, John's music has always been my life's soundtrack. If I can not be up in the mountains to paint, I still have John's words and music to inspire me. And he will continue to inspire me and thousands more, for the rest of our lives. For the love of John and the heart felt desire to have him remembered forever, I envisioned this Memorial Bench by the lake in Central Park. John once said that Central Park was a testament to just how much man needs to have nature around him, that this prime piece of land in the middle of New York City would be left alone so that we would have a place to walk in nature and renew our spirit. Some fans wrote to tell me that they had seen John walking through the park right before his NYC concerts, and he was smiling and whistling. These stories made the park an even more special place for John's memorial to be. So go walk through the forest, by a clear blue mountain lake, wonder at the graceful way of flowers in the wind. And if you are real quiet, you will hear John's Windsong through the tops of the trees. And if you are in New York City, come sit on John's Memorial Bench, look out over the lake. Maybe John will come sit by your side. And if you listen real closely, you just might hear him whistling. All profits from the sale of this CD will be donated to The Hunger Project. WWW:http://www.thp.org. Frank sang this song in Aspen during the October 12, 1998 memorial. He also performed in April 1998 at The Mint in Los Angeles. He has recorded several other songs, two of my most favorite are I Could Never Let You In and I'd Rather Be In Colorado. John was as friendly as anything and seemed delighted to meet a "fellow Texan." He shared a couple of funny high school experiences. He knew the area I was from though he was from across town. He signed his autograph to me "yea Texas!" (I still have that autograph.) 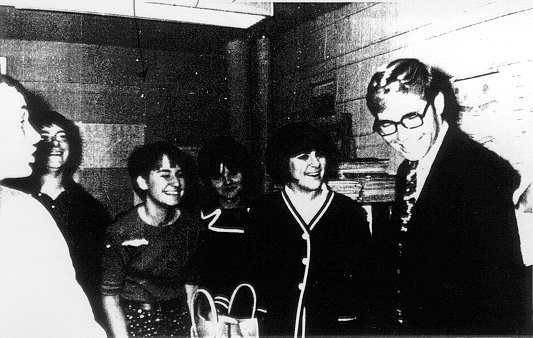 Some newspaper shots were taken by student journalists, and I still have those too. I wasnt involved with that, and so the fact that I have them is really an "accident." Like Johns, my family moved often. We werent in the military, but as a kid, I went to 6 schools in 3 states. I knew what it was to be new on the block, especially with a Texas accent!! When I read his book later on, I could really identify with that part of life. As time went on, I "grew up" with him. As the 70s moved on, environmental consciousness was in us all, and there he was singing "Eagle and the Hawk", or riding horseback in Alaska. I dreamed of going there too, and actually did, about 9 years later! I visited Colorado, shot lots of photos, and painted several paintings of the Rockies - even painted one of John in his cowboy hat! I made a fall slide show, and used his fall selection of the "Seasons Suite" as the background music. I still show the slides. When he and Annie had trouble, my own marriage did too, and after I remarried, I heard he had done that too, and in my heart I was so glad. It broke my heart when I learned that that relationship also broke up. How could that be? But then I do understand...it happens. Life isnt easy. Ive read his book over and over and I understand the problems he had with his father. I had problems like that too. And then, like John, I lost my dad. It is said that singers touch our hearts, reach out and capture us right in our own living rooms, just with their music, and a sort of "relationship-feeling" develops. Im not a nut. Im an educated, professional person with a serious job, a son, a marriage, and a life. I sing in my church, and say a prayer for John and his mom whenever I think of them. Today I have a lifelong love of birds and a reverence for the outdoors that I cant help but believe that Johns presence and music contributed to. And things like that return again and again. I guess this teaches me that if I feel the leaning to encourage, to say hi, to reach out to someone ... that I best not procrastinate but to just do it. Make the time to share the feeling. Ill never forget John. I look at the pictures, read the book, look at his autograph, and of course, play the tapes and records. Ill be driving down the road and sing to myself: "We didnt know who we were, we didnt know what we did; we were just on the road..." The good memories will live on to connect with other events in our lives and produce more good memories, and we can share them with those who are around us, just the way John shared "Back Home Again." I first heard John Denver sing on a car radio while I was on vacation in Virginia in July of 1971. At first he was just another great voice singing a pretty song "Country Roads." As the years went by and I got to know John through his music, I realized what a precious gift he was from God. His wonderful words changed my way of thinking about the world, helped me to be more compassionate towards other people, and taught me that I am a special person too, in my own way. He helped me to see the beauty in everything around me, from something as small as a blade of grass, to the vastness of the ocean. I will miss John every day of my life. My only regret is that I never had the chance to meet and talk with him. Every morning when I awake and every night before I fall asleep, I say this prayer for his beautiful soul: "Dear God, I pray for my beloved friend, John, in the hopes that he is at peace and living in the mountains of heaven." Dear John, you are more special than you ever realized and there are millions who love you and still deeply mourn your loss. But I know that you are still with us and taking care of us. Please be at peace, my dear friend. I captured a moment yesterday, and shared it with you. in your love of life - and passion. to a hope that this moment could last forever. But even dreams cannot change destiny. in memory, and we held time. Evening turned to dusk, then night. and our hope dissolved into the newborn day. So today has come. As tomorrow will come. And the next day, and the next. even for two souls clinging to a dream. I will reach for the stars you gave me that night. and I will reflect back in time. and shared it with you. and swing across the sky. My friend youll always be. to a person in their sight. are in the sky at night. I am the woman who is getting this Memorial for John in Central Park. I can send you the link to the JD web site that has color photos of the Memorial site, and all the info on the bench, plus updates on how we are doing. I had a lot of nice people who attended the various JD Memorials on Oct. 12 giving out flyers about the JD Bench. Its good to hear that the bench is being talked about. Now if we can only get the last $1,400 and make it a reality for our John. I then have to start planning the Formal Dedication of the Bench. Thats going to be fun! Tell all your wonderful John Denver friends that on Saturday, January 16th, the John Denver Memorial II concert will take place in Larkspur, CA at Ross Valley Masonic Auditorium, 1122 Magnolia Ave. (Call 510-234-8843 for any other details.) Many artists will be appearing that evening during this 3 day weekend. Also, here in Monterey, we will be featuring Jerry John River in a concert, from Delft, Nederlands, who will sing all John Denver songs in the concert called "A Night of Song." Also appearing will be local singer/songwriter, my friend Terre Noble, who made a great CD last year. It will take place in the Unitarian Church of the Monterey Peninsula, 409 Aguajito Road, Carmel, at 7:30pm on Saturday night, January 9. Thursday night, January 14, there will also be a concert featuring Jerry John River at the First Unitarian Church, 110 North Third Street. This concert will begin at 7:00pm and everyone is invited. Becky REBECCA.BARBER@roche.com is in charge of the arrangements there. THANKS A MILLION for getting the word out! Re: THE BENCH IS A REALITY! Hi Carol, well the update is that I received enough in donations for the bench! So, it is a reality! We will probably have the dedication in the spring, probably May. I will be posting in the news group and Rocky Mountain High site as the plans progress. The bench is a reality and I thank everyone who supported me and John's Memorial with all my heart. Keep in touch my friend. Words by Dennis Ducey, Music by Dennis Ducey and Steve Gorman. Written for my lovely lady, Patricia. Once I never knew the Joy that Love could bring. Once I never knew that Love could make Me sing. And then You came along and filled my heart with songs. And Now my heart Cries Out To S - I - N - G - - - - - - - . Touch Me with Your Smile And watch My Smile G r o w .
Touch Me with Your Smile And Set My Heart A g l o w .
When You Share All the Joy You Find In Living Every D - a - y - - - . All The Joy That Makes Me S - I - N - G - - - - - - - - . and Love Is Not All The Things the Poets try to S - - A - - Y- - - - - - . When We Share All the Joy We Find In L i v i n g E v e r y D - a - y - - - . All The Joy That Love can B -- R -- I -- N -- G - - - - - - - . and Now My Heart Cries Out ITS Here That You B - E -L - O - N - G - - - - . When We S - -I - - N - - G - - - - - - - - . (spoken) sing it with me. Touch Me With Your Smile And watch My Smile G r o w.
Touch Me With Your Smile And Set My Heart A g l o w.
When We Share All the Joy We Find In Living Every D - a - y - - - - . All The Joy That Makes Me S -- I -- N -- G -- -- -- -- -- . Touch Me with Your Smile and watch My Smile grow. And Set M - y H-e-a-r-t A - a - a G - l - o - o - w - w - w - - - .